Cherry season. Is upon us. I’m bringing this beautiful cross between a custard and a pancake to an afternoon party in Napa Valley today. Check the perfectly browned edges, please. With the lightest, airiest, subtly sweet-and- studded-with-cherry fruit-center. Now this is a pancake that’ll get you up in the morning. While the clafoutis was in the oven, I whipped up some pasta. 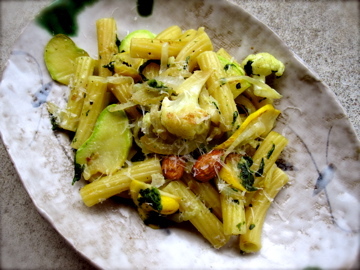 Rigatoni with sauteed onions, cauliflower, and pattypan squash. Fresh pesto made in my mortar and pestle. Almonds. Cheese. I ate too much. It was worth it. 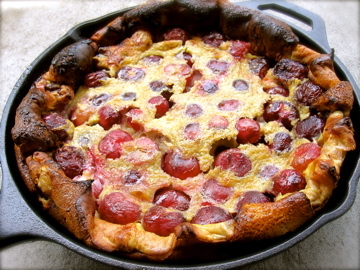 A cherry clafoutis was one of the first recipes I ever posted to my blog. 2 years ago. Dang. Well here I go again. 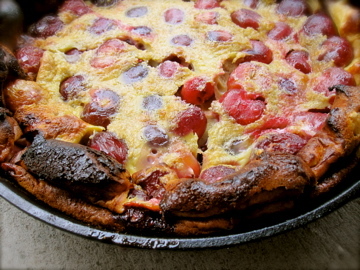 Cherry clafoutis, round 2. 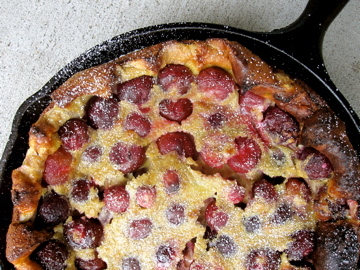 #2 The pits give the clafoutis a subtle almond flavor when baked. 2. In a blender or whisking by hand, combine your vanilla (or almond) extract, 6 eggs, 5 tbsp. sugar, milk, kirsch, and salt and whiz for a few seconds until blended. Then add the flour and blend for one more minute until smooth. Let the batter rest while you prepare the cherries. 3. Melt the butter in your cast iron skillet (or any oven proof skillet or pan), making sure to coat the pan and the sides very well. Once the butter starts bubbling, add your cherries, coating them and cooking for about 2 minutes. Sprinkle with 1 tablespoon of sugar and continue cooking for one more minute. 3. Pour the batter over the cherry mixture. Bake in the oven for 30 minutes. Do not open the oven midway through baking. Pull the pan out after 30 minutes, you should have a nice puffed, browned clafoutis. Let it cool for a few minutes then dust with confectioners sugar. Slice and serve.